Get your own IR Jammer Kit here on our store, or get it from the Maker Shed. Look at the Kit page here. The IR Jammer is a fun project that provides a bit of safe, non-destructive fun. The Infrared Remote Control Jammer allows you to render all IR remote controls inoperative! The microcontroller in this design allows for all 6 of the main IR frequencies to be targeted making this unit universal. It works by corrupting the data that is being sent by your normal remote controls. A single press of the button sends out stream of IR pulses from the two narrow beam and two wide beam IR LEDs for 30 seconds. Each press of the button will add 30 seconds to the running timer. For remote operation you can simply connect a button to the On Sw. pads, shorting this input will turn on the IR output until the contact is opened. This would allow the device to be mounted into an old remote, brim of a hat, etc. The compact design is the size of a 9 volt battery allowing it to be strapped directly to its power source if desired. The heart of the IR Jammer is a PIC 12F675 microcontroller. 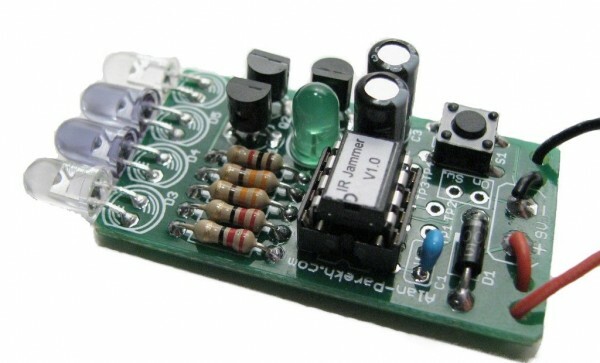 This microcontroller has been programmed to reproduce the 6 popular IR frequencies, 30kHz, 33kHz, 36kHz, 38kHz, 40kHz and 56kHz. When the button is pressed two transistors are used to pump infrared data out of the 4 IR LEDs. Using two wide beam and two narrow beam IR LEDs allows good distance and a ease of use. The Green LED is used to indicate power up by blinking 3 times and also to indicate when the jammer is running by a quick flash ever few seconds. When building the kit you can select the power selection resistors to adjust the balance between range and power consumption. After the jammer flashes the green LED to indicate power on the unit goes to sleep and wakes up on a pin change interrupt, this allows it to last a very long time in standby. The PCB mounted push button will wake it up and allow it to operate for 30 seconds for each press and the On Sw. remote switch connection will run the jammer until the switch is turned off. There are 6 assembly language routines that are used for each of the IR jamming frequencies that the device replicates. Click on the image for a large version of the schematic. Subscribe to comments with RSS or TrackBack to ' IR Jammer – Infrared Remote Control Jammer '. the schematic image is not linked to the larger version of its self …. The schematic is now linked up. For automated operation, install an IR receiver module such as Vishay TSOP1100 in place of or in parallel with pushbutton S1. This will trigger the jammer to begin transmitting whenever it senses an IR remote signal. You’ll want to add an on/off switch to conserve battery power, as the receiver module draws 1-2 ma. That sounds like an interesting hack! As an added feature you could implement a “passive mode” in which the jammer, using an ir receiver will immediately jam only when it sees a remote being used. It would have to be positioned properly, I don’t know if it would work, but if it does it could greatly extend battery life. That is a good idea. I was thinking about a feature like that when it was being developed. The main reason I didn’t implement any type of detection means is because the IR from remotes is very narrow and would probably not be picked up by the unit unless it was being pointed at it. This is not a comment but a cry for help. My commputer was hijacked.. my tv was hijacked bu yhr people who has a homemade audio video transmitter and they control my tv and computer. Im not capable of building the jammer to stop them.. is there anything that can be bought ready made. I saw ones that works through the walls.. if you know where is this site.. or if u make them can u tell me how much this will sell for? ok i need something i can remotely control to turn a tv down in another room secretly anyone got a solution for this ? Yes but you would need to code it and have a programmer to get the new code onto the chip.